Jack Bell Gallery is pleased to present a solo exhibition of new paintings by contemporary artist Lavar Munroe. In this series Munroe works with acrylic and mixed media on canvas, exploring themes drawn from current political spaces and societal ills being experienced in the world today. This will be the artist’s fourth solo show at the gallery. Throughout history, mythology has emerged from humankind’s desire to understand our surroundings and our anthropologic makeup. My interest in this field stems from recent travels to Senegal, where I researched the lives, existence, and survival of local cultures. Inspired by ideas surrounding stages of Joseph Campbell’s Monomyth also known as The Heroes Journey, my work there comprised of investigations into the relationship between transformation and myth. Based on photo documents and artifacts collected over a four-year span from various cities in Senegal: Goree Island, Tambacounda and the Sinthian Village, I have developed a series of fictitious narratives and characters known as The Redbones. The Redbones are a generation of young boys who are placed on the frontline as warriors by the wealthy within society. Ironic to the storyline is that The Redbones are a generation of boys from poverty stricken areas recruited and hand selected to fight for freedom and justice for all. The boys march, protest and go to war simply as a rite of passage in hopes of one day being deemed heroes by the wealthy. This project is an examination and critique of journey, pilgrimage and the notion of martyr as hero in regard to acts of protest and war. I am interested in telling a story of success whereby I trace a journey that begins in an impoverished state, both mentally and physically, which ends in a place of enrichment. Lavar Munroe b.1982, Nassau Bahamas, works between Germantown MD and Nassau Bahamas. His work is currently on exhibit at the MAXXI Museum in Rome. Upcoming exhibitions include solo shows at the National Gallery of Bahamas, Nassau, and the Meadows Museum of Art, Louisiana. 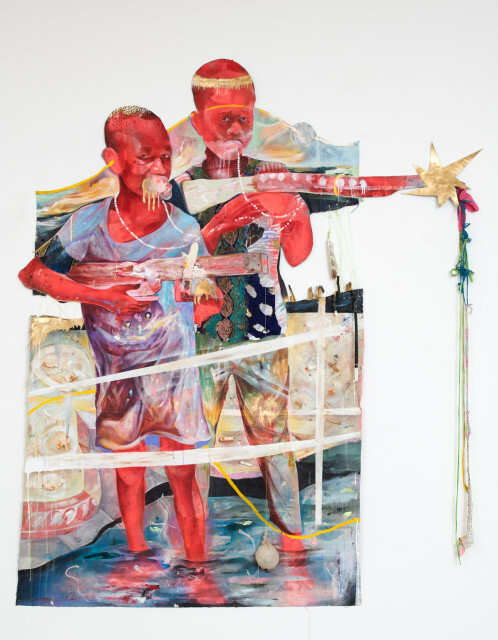 Works have been included in previous exhibitions at ‘Prospect 4’ triennial, New Orleans, directed by Trevor Schoonmaker, ‘All the World’s Futures’, 56th Venice Biennale, curated by Okwui Enwezor, 12th Dakar biennale, curated by Simon Njami, Orlando Museum of Art, Nasher Museum of Art at Duke University, and SCAD Museum of Art among others.